Add a new custom to the October traditions of Halloween candy, costumes and setting back your clocks: The end of Daylight Savings Time is the perfect time to change the batteries in your smoke alarms and to check the readiness of your fire extinguishers. Smoke alarms are commonplace in homes, but fire extinguishers are still underutilized and misunderstood safety tools for many renters and homeowners. Your Trusted Choice® agents at Neely Taylor Wade Insurance want you to know that owning the proper extinguishers and understanding their correct use could mean the difference between a major fire loss to your property and a relatively minor cleanup. If you need to brush up on your fire safety knowledge, a great first step would be to study the animated fire-extinguisher tutorial provided at FireExtinguisherTraining.com. With clear and simple explanations, it reveals the four elements necessary for a fire to exist — oxygen, heat, fuel and a chemical reaction — and how the right extinguisher works by removing one or more of those elements. The tutorial also clarifies the different types of fires — classified as A, B, C, D and K — and the specific extinguishers designed for each. 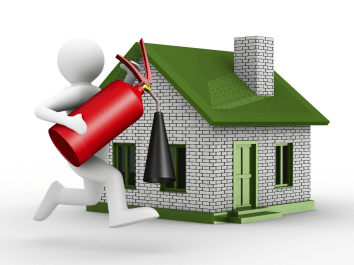 Determining the most likely classification of fire to affect your home helps you purchase the proper fire extinguishers. If you already have purchased appropriate fire extinguishers for your home or apartment, congratulations! But don’t let your best-laid plans be defeated. We recommend that you practice the proper use of each type of extinguisher — since the last thing you want to do when confronted by a sudden fire is to read directions or, worse, waste the power of your extinguisher through improper technique. • Be sure the fire extinguisher is visible and easily accessible. • Be sure the safety seal is not broken or missing. • Be sure the gauge or pressure indicator arrow points towards the green section, indicating correct pressure. • Be sure the extinguisher shows no corrosion or leakage and has no obvious damage, such as dents, gouges or burn marks. • Be sure the operating instructions are legible. Smoke alarms and the proper use of fire extinguishers can help minimize the risk of a small fire turning into a major conflagration. But when the worst happens, the proper insurance coverage is an excellent and necessary safety net. Talk with Your Trusted Choice® agents at Neely Taylor Wade Insurance about a review of both your safety preparations and your current insurance coverage to be sure you, your family and your valuable possessions have the protection you want and deserve. • In the U.S., an average of seven people die per day in home fires. • Of all fires in structures or buildings, fires in homes cause 92% of civilian deaths. • Fires in homes that have no smoke alarm cause 37% of home fire deaths. • Nearly a quarter (23%) of home fire deaths happen in homes that do have smoke alarms, but the alarms do not work. • From 2007 to 2011, the average annual direct property damage from home fires was $7.2 billion. • The two major causes of home fires are cooking equipment, which causes 43% of home fires, and heating equipment, which causes 16%.